In June I made a request to the BOE for breakdowns of staff within different salary bands by age, gender, ethnicity etc. One of the frustrating aspects of their response was that they grouped together salary bands, giving a single figure for people earning between £17k and £46k. They explained that the reason for this was to allow data from the Prudential Regulation Authority to be combined with BOE. I don’t have salary amounts for PRA, but have done a quick graph of numbers of male and female staff at the end of this post. 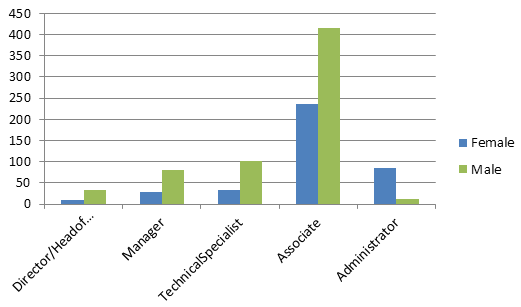 For staff employed directly by the Bank of England, I now have numbers of staff in each salary band by gender. The bands are given in a public document on the BOE website, and I have taken the reference point, or the mid-point of each band, to ease comparison. Suddenly it is very clear that there is only one band with more female staff – Band 6, and there is almost parity between men and women for the two bands either side. These are the bands with examples given such as “Senior Clerical Staff, Research Assistants, Support Staff”. We already knew that more than 80% of the staff in Band 1 are male, but it is particularly interesting to see the pattern like this – very clearly the proportion of men steadily increases as you move up to the highest salaries. Given that there are vastly more men earning the highest salaries, I did some very crude calculations to see roughly how much is earned by men and women at the bank. Assuming (a very big assumption, of course) that everyone is earning the median or reference point for their band, the following graph gives an impression of how much income is held by each gender and band. As the columns show, there is significantly more money held by the large proportion of men in the top three or four salary bands. 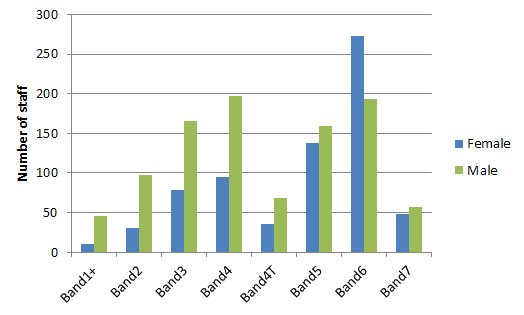 Due to the significantly higher salaries, the small number of staff at the top of the organisation hold vastly more money; in the lower bands, there are many more staff, but overall earnings are much lower (shown visually as the bars being lower than the lines only towards the right hand side). 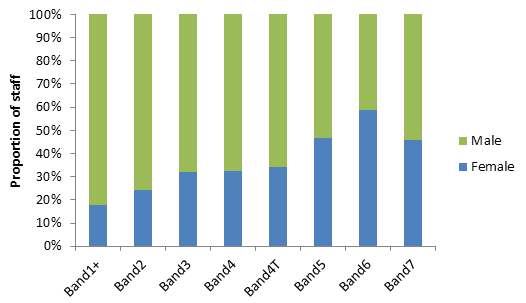 Bar chart showing total earnings across each gender and salary band (number of staff x median salary in band) overlaid with lines showing number of staff in each band. 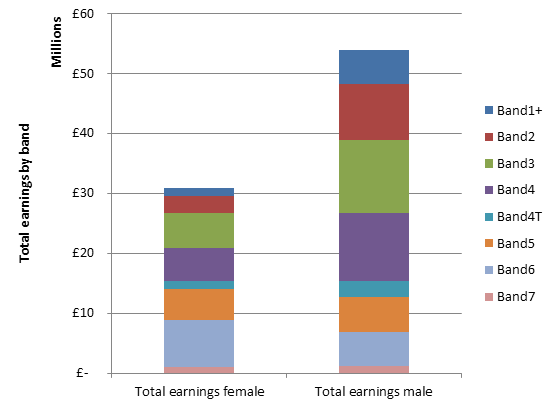 Stacked bar charts showing total earnings for women and men at BOE. 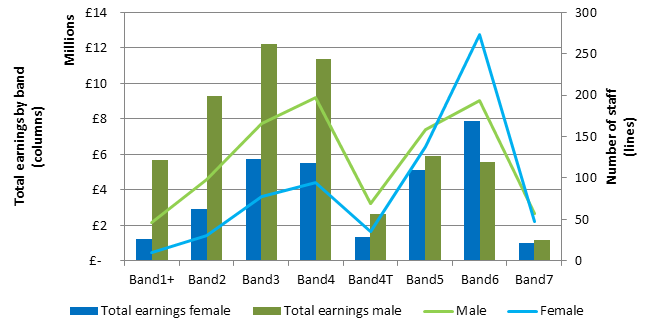 Overall, there is variation but rough parity between genders up to band 4T, or £38k, but then earnings among men shoot up as they have significantly more staff earning at the higher bands. With 276 more people (985 men and 709 women), the men working at the BOE earn £23 million more than the women. All of this really serves to confirm what we suspected all along – that the BOE is dominated in management and authority roles by men. What we can’t answer of course is why, but research elsewhere tells us time and again that structural inequalities have an effect on women at every level of organisations like this. We also knew that until recently, the board of BOE was entirely male, although there are now (since July 2013) two whole women listed among the Governers and Executive Directors. I hope that, in future, with at least those two voices having some influence at the top of the Bank, we won’t end up in another situation where we’re faced with having no women represented on our banknotes. Finally, the Prudential Regulation Authority staff numbers, showing the same pattern of more women in the lowest salary bands and more men in the highest.